If you love animals especially dogs, running a Preppy Pet Franchise could be the passion that takes you to a new level of career satisfaction. Love Pets, Love your Job and Have Fun at Work. Over 70% of American families own one or more pets, When they travel, they’re seeking a caring boarding facility where their pets will enjoy themselves. With both partners in many homes working, more families are opting for doggie daycare for their pets a chance to socialize and get plenty of exercise for a well rested night. The Pet industry spending now totals around $70 billion dollars annually and increasing, even grew during the great recession while other business segments struggled. Looking for the right pet franchise to invest in? Preppy Pet Franchises is the only choice! True To Our Heritage Preppy Pet started modestly in 2003, offering excellent services at fair prices while expecting a quick return on investment. Today we are still operating at that same location in Orlando which is our headquarters, while most pet franchises and independents alike close to us and across the nation have broken records of spending with huge opening costs, drowning in debt service with big operating costs leading to high daily dog break even, high risks and failure. Preppy Pet stays true to its heritage and holding to our concept of maintaining both a low opening and operating costs. This conservative approach is more important than ever in today’s business plan. We would never ask more from our franchises than how we started. There are few franchises that can say that today. We can still offer a Complete Pet Care Business, Turn-key, ready to operate for around $100,000 for a smaller floor plan to a large floor plan for less than $200,000. You will spend much more if you open a independent location without the proven and successful business plan, training and ongoing support that Preppy Pet offers. 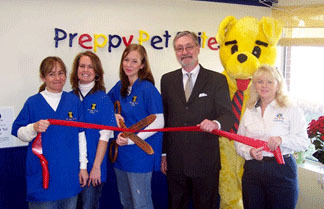 Preppy Pet Provides More Revenue Streams than any other Pet Franchise. There are several pet franchises that offer a few limited services and products, but why restrict your business, increase the risk of failure and struggle financially on the ramp-up period or even wait years for a return on investment? Preppy Pet believes in maximizing the square footage and your investment with offering more sales and services while increasing the 2 and 4 legged customer traffic count. Preppy Pet provides a fun, affordable and rewarding franchise for Overnight Pet Boarding, Doggie Daycare, Grooming and Training for one low franchise fee of $19,900 to $34,500. Overnight Pet Boarding and Doggie Daycare Preppy Pet is certainly not your traditional kennel or veterinary clinic that boards or even that expensive pet hotel with a one price one size fits all. We simply offer a spacious, clean, fun, and safe place at affordable prices. It all starts with our Smell and Tell Tour to build new customer confidence. We offer more customer options with fewer restrictions as we provide the right pet suite to match the size of pet or pet family while meeting the guests budget. Once guests visit, they will return with the tails wagging as we have very high customer ratings through our online surveys. Our boarding concept is appealing to all customer levels. Grooming, Training and Adoptions Preppy Pet offers Spa Bathes to Full Grooms from skilled and trained groomer employees. We also provide puppy house breaking to obedience behavior dog training classes from local dog trainers. Finding pets a new loving family can be very fulfilling through our adoption program. Preppy Pet Franchises Helps You Achieve Success from assisting in financing, finding your perfect location to offering our many services that you can provide customers in our Pet-Friendly Focus Signature Decor– A true preppy logo, easy to remember name with matching website address helps you build identity in your market to our Modern Designed proprietary custom modular kennel suites. Easy to Navigate Website, Custom Software, Complete HQ Training to a Proven Business Plan with Quick-start Marketing Program, Plus On-going Sales and Support at the Lowest Royalty Fees in the Pet Industry. Visit our Facebook Page link below for updated information, News and Photos. Our Goal is to provide a fun, affordable and rewarding franchise. To learn more, read our franchise Q & A and complete the short form on our contact us page. How is Preppy Pet different from other Independents, Chains, or Franchises? Most upscale pet boarding facilities are forced to keep raising prices and overcharge for their services due to an exuberant start- up costs along with high operational costs that causes such a high breakeven. Their early business plan shows that 100 dogs times $50 each daily equals profit, soon to realize it takes months or even years to reach such goals. Most pet boarding facilities charge customers the same to board a 3lb Chihuahua or 150lb Great Dane and also you are forced to purchase play even though it is a 12 year lab with arthritis. How large is a Protected Territory? Preppy Pet Franchises provides you the exclusive rights to a large geographic area that will prevent others from opening a Preppy Pet within a defined territory, You will market and advertise in that large defined territory, however you are permitted to care for pets to customers driving to your location from outside of your territory. You are in control of many of the variables in getting your location open. We assist you with our Site Selection Manual in finding an approved location and help negotiate the lease or purchase with our commercial real estate knowledge. Our step by step build out manual and vendor list guides you to open your location promptly with most units opening 90 days from securing the location. We schedule your training 4-6 weeks prior to opening. Preppy Pet has many advantages for a quick and easy startup such distributing and Supplies. How much can I earn now (Return On Investment) and will it build equity for the future? We are unable to provide predictions of how much you will earn in your specific franchise location however, we do include Revenue and Labor costs in our Franchise Disclosure Document (FDD). Your ability and willingness to execute the business plan we’ll share with you during your training will be a prime factor in your success. You control your profit margins and expenses in your franchise. You will be pleasantly surprised in how much equity you should gain in building your Preppy Pet. How much does a Preppy Pet Franchise cost to open? We charge an initial franchise fee of $19,900 to $34,500 to help offset our costs of recruiting you and helping you launch and run your business. In addition, you should have a minimum of $75,000 to $150,000 to cover initial equipment, build-out, inventory, supplies and lease payments. Typically at least $25,000 plus in credit line or cash should be available as needed to offset costs that exceed your profits in the early months. We estimate that most franchisees will spend around $100,000 for a smaller kennel plan, to less than $200,000 for the larger kennel plan, to open a Preppy Pet offering Overnight Pet Boarding, Doggie Daycare, Grooming, Training and Adoptions. Preppy Pet does not directly offer financing to prospective franchisees, but we may be able to guide you in finding funds for your business. We work with several companies that handle SBA loans, equipment leases to 401K exchanges. What are the major differences from Preppy Pet Franchises and other pet care franchises? Preppy Pet Franchises is the only affordable pet franchise that offers full capacity of Overnight Boarding of all pets, Doggie Daycare, Grooming, Training services and Adoptions all under one roof. Our method of opening an effective location along with operating efficiently is part of our complete business plan. We eliminate the high costs of investing a half million dollars and up to open a Kennel or Doggie Daycare Facility. What are the ongoing costs of a franchise? Like most franchisors, we charge a royalty fee on your ongoing sales of 6.5% due monthly (not weekly like some franchisors) This motivates us to help you grow your business and increase sales, year to year, resulting in an increased revenue stream for all Preppy Pet. Unlike our competitors, Preppy Pet has no ridiculous minimal sales requirements that may increase your royalty fees 7 to 10% Plus No After Hour Emergency Call Fees, No Administrative fees, No Website Maintenance fees, No Webcam fees, No Annual Software Upgrade Fees and more that you need to be aware of from some franchisors that will lead to a very high costs of sales along with a poor return on your investment. Preppy Pet Franchises understands that you need to be profitable and we all grow together. What steps should I take to further explore the Preppy Pet Franchise? So that we can gain a better understanding of you, we ask that you complete our Qualification Sheet and forward it to us. Upon reviewing this information then speaking to you and we agree you’re a good candidate for our system, we may ask that you review our federally-mandated Franchise Disclosure Document (FDD). Our franchisee friendly FDD completely explains the terms of our offering and includes a copy of the Franchise Agreement that you will sign. What type of person makes the best franchisee? As a Preppy Pet franchisee, loving pets especially dogs is important, you will love your job and have fun at work. You will recruit and manage a staff of 2 to 10 employees once you have been open and are established. You and your employees will care for, play with the pets your customers leave at your facility for overnight pet boarding, doggie daycare and grooming. Feeding, washing the pets and cleaning their suites are other important roles for your staff. Choosing the right people, training, motivating and managing them is an important aspect of your success. We will provide you with many tools such as employee handbook and other employee guidelines. Most owners manage the sales process, procurement, advertising and the finances of their businesses. A strong commitment to providing outstanding care to the pets entrusted to you is critical, as is a desire to run a successful business. Where do I buy my equipment to open a Preppy Pet? Preppy Pet offers kennels, materials and supplies which can be purchased from third parties utilizing our vendor list with savings negotiated by our network. This is a major savings. Why a Preppy Pet Franchise over opening an independent location? Dept. of Commerce Study: Only 28% of Independent start-ups are still in business after 5 years! While over 90% of Franchised ventures survive their first five years in business. Many reasons for this, some such as demographic research, lease or purchase negotiation, zoning issues for your location, complete proven business plan. Preppy Pet offers you the ability to be part of a growing network, where strength in numbers is so important to survive against other franchises and major chains now entering into this industry. You will have access to our complete business plan which includes our network purchasing power, accounting and kennel software, complete training as needed, quick start marketing program, on-going support, and more. Preppy Pet Franchises can reduce your risk and offer a much quicker and less costly opening than you may do on your own. Why Pet Business over other type businesses that we looked at?